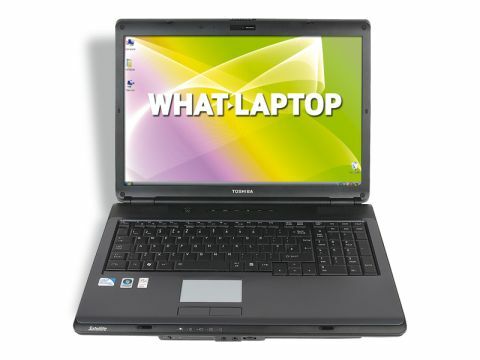 Toshiba's Satellite range is its entry-level consumer series, and is known for its sturdy build quality and reliable usability. The Satellite L350-17P personifies these strengths, but it falls short in key areas when compared to its rivals. The 17-inch chassis is by far the largest in this group test and is built for desktop use. The bulky design and 3.1kg weight ensure this is a laptop you won't want to travel far with. Battery life impresses, however, providing more than three hours use when away from mains power. Build quality is excellent, with sturdy plastics used throughout. The matt gunmetal grey finish is very resilient to scuffs and scratches, making it well suited to family use. The large ventilation fan on the chassis' left-hand side ensures the machine is kept cool at all times. The main advantage of the big chassis is the spacious user interface. The full-sized keyboard is extremely comfortable to use and all the keys move smoothly and firmly when typing. A dedicated pad of numeric keys is also in place for inputting data. This laptop uses a 16:10 widescreen panel. The 17-inch Super-TFT screen is large enough for multimedia use, but lacks the wide 16:9 aspect ratio of its rivals. Images are sharp, but brightness, colour and contrast lack definition. Multimedia performance is also disappointingly poor. The use of a low-powered Intel GPU provides limited graphics power. Basic photo and video editing is possible, but a laptop with a dedicated graphics card could offer far more power. Home performance is far more capable. The dual-core Intel Pentium processor betters the AMD-powered laptops you often find at this price, and allows you to multi-task with a certain degree of speed. This was borne out by a strong display of performance in our demanding tests. Unfortunately, poor storage again lets this machine down. The 160GB hard drive suits basic use, but is bettered by most other laptops. There is also no support for any flash storage card formats, so bear this in mind if you own a digital camera. Connectivity is also limited. 802.11g Wi-Fi and 10/100 Ethernet provide basic network connections, but are bettered by its rivals. A strong software package compensates somewhat, with office, internet security and DVD playback tools all included. With its strong usability and build quality, the Satellite L350-17P is a good family laptop. Unfortunately, its limited features and mixed performance prevent it from excelling, and its rivals provide greater value for money.